Actvity Summary: Children observe photographs and do simple introductory activities related to oceanography and ocean science. 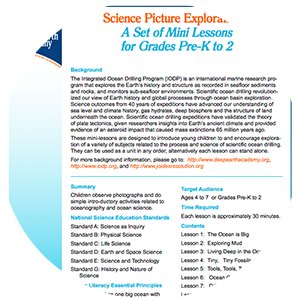 These mini-lessons are designed to introduce young children to and encourage exploration of a variety of subjects related to the process and science of scientific ocean drilling. They can be used as a unit in any order; alternatively each lesson can stand alone.